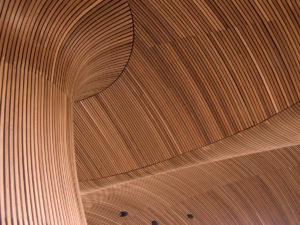 Wood may be the most popular of the biophilically designed construction elements. 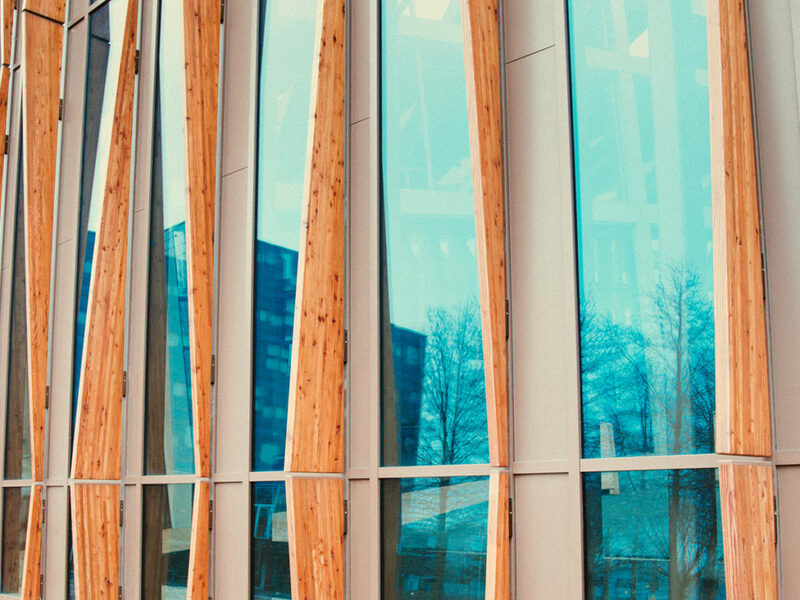 From simple aesthetic flourishes to large-scale architectural installments, wood is a central part of the biophilic revolution. 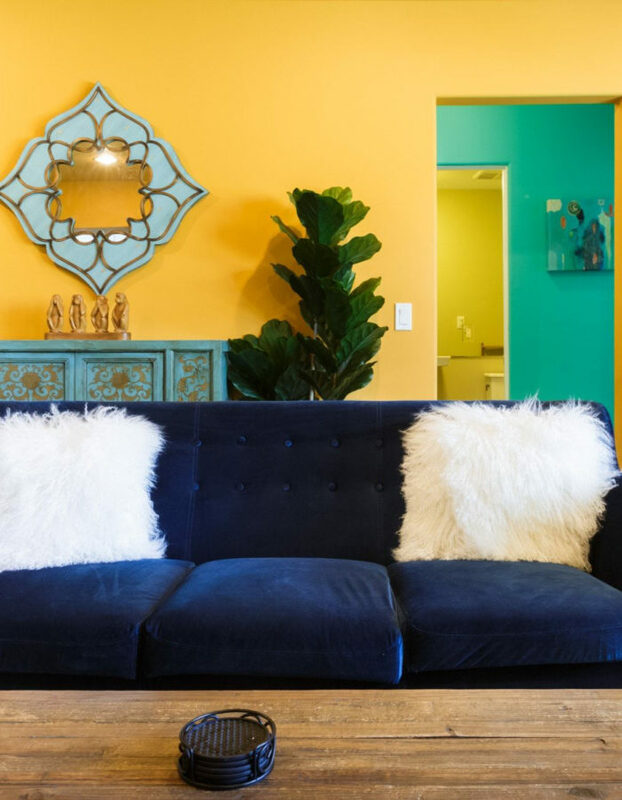 Ceilings are having their moment in the design spotlight. 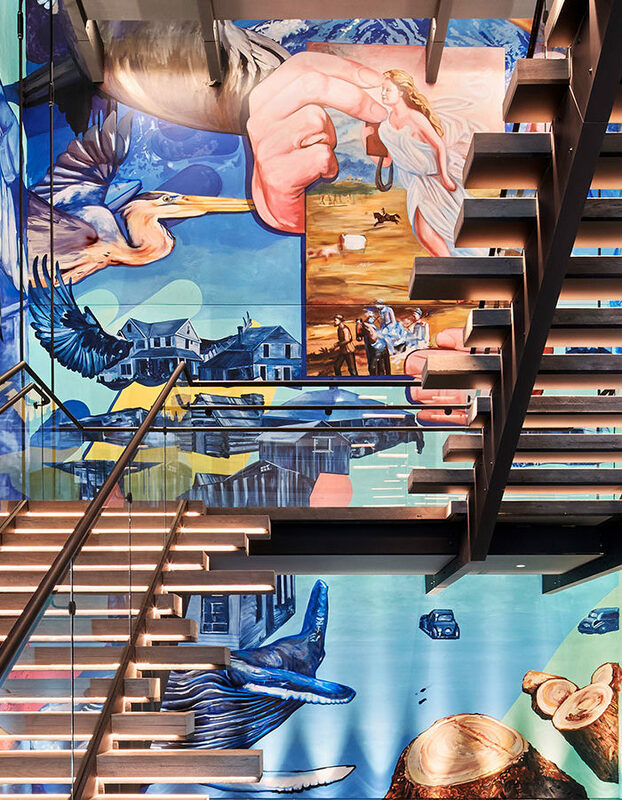 From hanging plants and skylights to statement ceiling designs and circadian lighting installations, the ceiling is the next frontier for interior designers and architects. 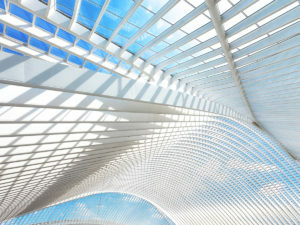 “Features such as biodynamic artificial skylights create interest as well as a sense of well-being. Adding vegetation into the mix has a number of benefits too—hanging plants create a sense of being among the forest canopy, can create interesting shadows and dappled light effects and also save valuable floor space,” Freeman said. 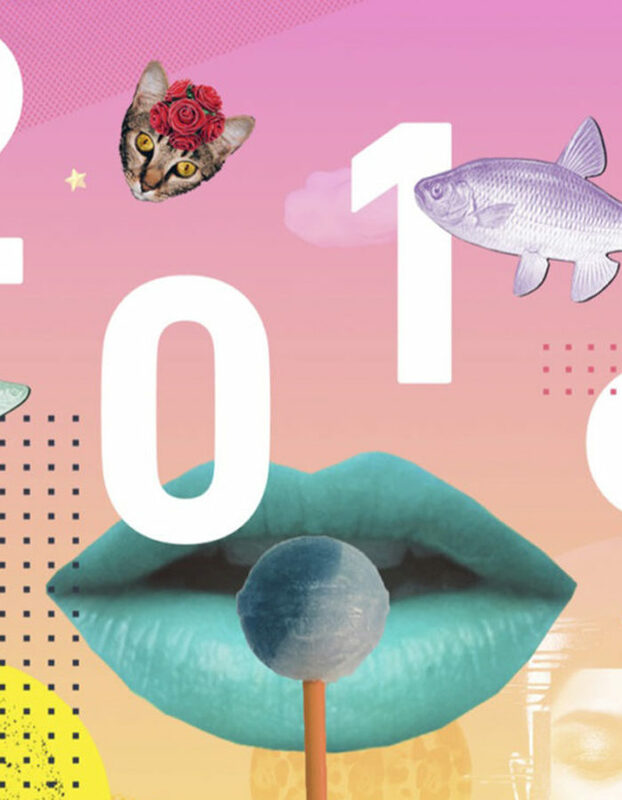 Trends data suggests that architects and designers are increasingly integrating plants, green walls, large green installations and more into designs during pre-construction and renovations, rather than adding them post-completion as secondary aesthetic choice. “Green walls are becoming cheaper and easier to set up and maintain, so are no longer confined to new-builds and major refurbishment projects. 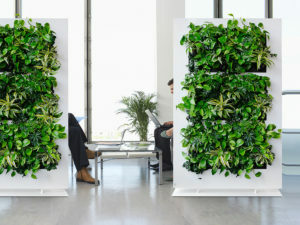 Space saving and right in the eye line, they are effective biophilic design elements that offer multiple additional well-being benefits, such as improved air quality and noise absorption,” Freeman said. Biodynamic lighting is the next evolution of commercial lighting. This trend introduces lighting systems that mirror natural sunlight conditions within the built environment, which help to regulate the human body’s natural circadian rhythm. 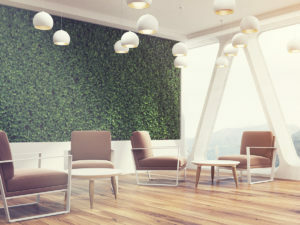 Green wall dividers, a revolutionary new space-enhancing element that provides resolution to many of the challenges facing open office environments everywhere, are agile and adaptable for dynamic workspaces while also incorporating a natural biophilic component at minimal cost and invasiveness. 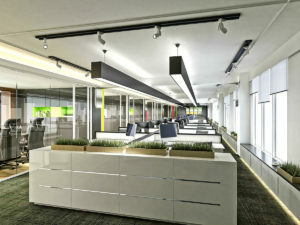 “As workplaces are becoming more dynamic and human-centric, so spaces need to be adjusted according to need. Activity-based working is a bit of a buzzword at the moment, but it makes sense to provide a variety of workspace settings suited to different tasks and activities. If space is at a premium, dividers can make that flexibility happen more easily as private space can be created in an instant, or opened up for collaborative work. Planted dividers, screens and even mobile green walls have many benefits—they have good acoustic properties as well, serving our need for refuge and shelter. As long as light levels can be maintained in all of the locations that these screens might be moved to (and that can often be managed with built-in lighting), then planted screens and dividers are a terrific choice for biophilic flexible space,” Freeman said. 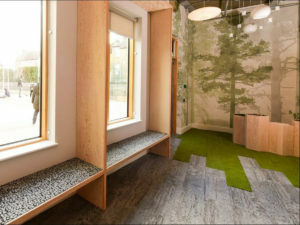 Carpet and flooring designers are incorporating uniquely biophilic design characteristics, such as natural stone, wood, forest floors and more, into their concepts. The goal is to create natural textures for floors that have the same distinct qualities as natural environments, such as the forest floor, a meadow or a riverbed. Thank-you for your design ideas. We need interior design and decoration for 40 room types, inter alia.